Revelation 1:9 I John, your brother and partner with you in oppression, Kingdom, and perseverance in Christ Jesus, was on the isle that is called Patmos because of God's Word and the testimony of Jesus Christ. Revelation 20:8 and he will come out to deceive the nations which are in the four corners of the earth, Gog and Magog, to gather them together to the war; the number of whom is as the sand of the sea. pat'-mos (Patomos; Italian: San Giovanni di Patino): A Greek island of the group Sporades, Southwest of Samos, mentioned once in the Bible, Revelation 1:9, "I, John.... was in the isle that is called Patmos, for the word of God and the testimony of Jesus" (dia ton logon tou theou kai ten marturian Iesou). The island is 10 miles long, and about 6 broad along the northern coast. It is for the most part rocky. The highest part is Mount Elias, which rises to a height of over 800 ft. As in Greece, and in the adjacent mainland of Asia Minor, the land is treeless. Near the city of Patmos there is a good harbor. A famous monastery, Christodulos, was founded on the island in 1088. Near this is a thriving school, attended by students from all parts of the Archipelago. The population of the island numbers 3,000, almost entirely Greek. The ancient capital was on an isthmus between the inlets of La Scala and Merika. Many ruins can still be seen. The huge walls of Cyclopean masonry, similar to those at Tiryns, attest their great age. In Roman times Patmos was one of the many places to which Rome banished her exiles. In 95 A.D., according to a tradition preserved by Irenaeus, Eusebius, Jerome and others, John was exiled here-in the 14th year of the reign of Domitian-whence he returned to Ephesus under Nerva (96 A.D.). The cave in which he is said to have seen his visions is still pointed out to the traveler. Only a small part of the once valuable library in the monastery of Christodulos is left. Just 100 years ago (1814) Mr. E.D. Clark purchased here the manuscript of Plato which is now in the Bodleian Library, the celebrated Clarkianus, a parchment written in the year 895, and admittedly the best of all for the 1st of the 2 volumes into which the works of Plato were divided for convenience. 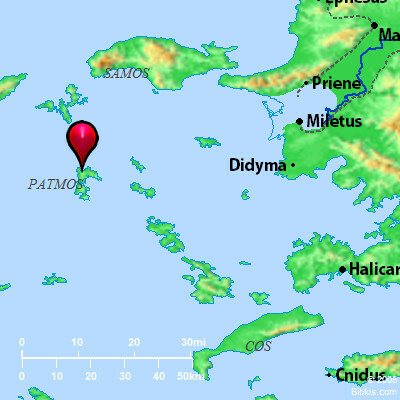 Patmos is mentioned by Thucydides (iii.33), by Pliny (NH, iv.23), and by Strabo (x.5). See also JOHN, THE APOSTLE; REVELATION OF JOHN. Tozer, The Islands of the Aegean (1890), 178-95; Walpole, Turkey (London, 1820), II, 43; E.D. Clark, Travels (London, 1818), VI, 2; Ross, Reisen (Stuttgart, 1840), II; Guerin, Description de l'Ile de Patmos (Paris, 1856). PATMOS, a bare rocky island in the AEgean Sea, 32 ms. w. of Asia Minor; now Patino (pron. Pa-tee'no). It is about 4 ms. across e. and w., 7 ms. n. and s., of somewhat semicircular form, the concave side being on the east.